Third-tier comedian Palito (that’s Tagalog for “matchstick”) was just one of many familiar faces from Filipino films of the Seventies and Eighties, a former vaudeville performer usually in bit roles in Fernando Poe Jr and Tito, Vic and Joey movies. 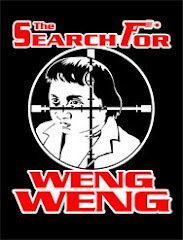 In a country renowned for its far-from-subtle humour, his schtick was simple – like a taller and much, much thinner Weng Weng, his anorexic frame cast him as a human dishrag or walking corpse, usually with a bandage around his head. Not surprisingly, the walking corpse routine never got old – or in two words, “Comedy Mould”. In the mid Eighties, when Palito was well into his fifties, he finally made it to star billing in a series of parodies of Hollywood hits. Following a stint supporting Redford White in the First Blood riff Johnny Rambo Tango (1985), Palito would become the Philippines next stick-thin Sylvester Stallone in not one but TWO Rambo clones, in which Palito would run around the Filipino jungle, arms like twigs, clutching an enormous hunting knife, and a rocket launcher that’s twice his width! 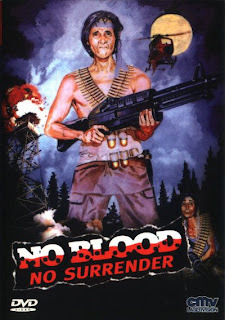 In No Blood No Surrender, Palito plays Samson, a mysterious Vietnam vet wandering into a small town looking for the daughter of his dead army buddy Hercules (Samson? Hercules?). Immediately he raises the ire of Mayor Mercado (played by Filipino supervillain Max Alvarado) who, with his private army of goons, wants to take the daughter’s house away from her. He’s driven out of town several times, only to return madder than ever. Samson’s former commander (popular comedian Dolphy’s sidekick Panchito, playing the Richard Crenna role) comes looking for him, and explains away Samson’s insane rampage (“I trained him…ex Vietnam”). ‘Nam may have been hell, but the Philippines is worse – much worse – with an angry stick insect on the loose. Imagine the horror of an action fan settling down to watch Palito’s apocalyptic redux of First Blood. No Blood… is an apt name, and not just because of its corpse-like connotations; it can’t make up its mind if it’s a spoof or the real deal, and although the film has its fair share of gun battles and explosions, and an unbilled cameo by Fernando Poe Jr as “famous actor Sylvester Stallone” (!! ), it fails as both. It does however work on a much higher, more surreal level, whereby the innate weirdness of Filipino goon comedies such as this and Weng Weng’s movies leave you floored, slack-jawed and wanting more. 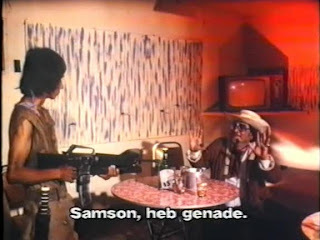 Like hundreds of Filipino-made films of the Eighties, including Johnny Rambo Tango, the film was dubbed into English and successfully sold overseas to the ever-hungry, ever-mewing VHS market. Another enterprising local producer attempted to go to the well a third time and cast Palito as Ram-Buto or “Ram-Bone” – unfortunately for all concerned, the well was dry, and Palito stayed on the local film industry’s hamster wheel. Jonrox Films gave him a shot at filming another of his popular characters the following year, James Bone: Agent 001 (1987), this time directed by No Blood…’s Ruben Ramos. I heard a rumour James Bone and Weng Weng appeared in a film together for Weng Weng’s producer Peter Caballes, but when I finally tracked down Palito in Manila to ask him, he couldn’t recall for sure (no doubt due to the Philippines' collective amnesia when it comes to their own cinema). He does remember doing numerous vaudeville stage shows with Weng Weng throughout the Eighties, where the sight of an anorexic beating on a midget would have been regarded as "champagne comedy". Palito is to this day STILL starring in Filipino movies, still on the hamster wheel, and still beating the same “walking corpse” schtick.